(a) Warm up the engine, stop it and wait 5 minutes. The engine oil level should be between the low level mark and full level mark on the engine oil level dipstick. If the engine oil level is low, check for leaks and add engine oil to the full level mark. A certain amount of engine oil will be consumed while driving. In the following situations, engine oil consumption may increase, and engine oil may need to be refilled in between oil maintenance intervals. When the engine is new, for example directly after purchasing the vehicle or after replacing the engine. If low quality engine oil or oil of an inappropriate viscosity is used. When driving at high engine speeds or with a heavy load (when towing, etc. ), or when accelerating or decelerating frequently while driving. When idling for a long time, or when driving frequently through heavy traffic. When judging the amount of oil consumption, keep in mind that the oil may have become diluted, making it difficult to judge the true level accurately. (a) Check the oil for deterioration, water contamination, discoloration or thinning. If the quality is visibly poor, replace the oil and filter. (a) Remove the oil pressure switch assembly (See page ). 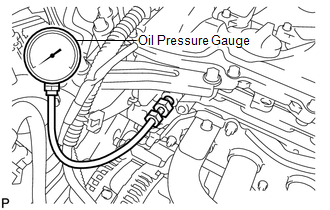 (b) Install an oil pressure gauge. (d) Measure the oil pressure. (e) Remove the oil pressure gauge. (f) Install the oil pressure switch assembly (See page ).